Summary Thomasson Dura has realized two projects with inexpensive DuBo (sustainable building) dwellings in Harderwijk. The first project consists of 30 residences with solar panels on the roof of the extended living room at the garden side. 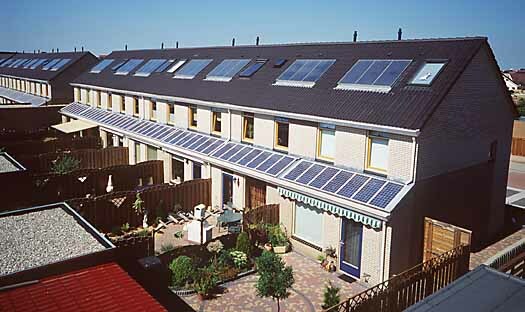 In the second project, solar panels are located at the front side of 21 residences. In this project, the upper part of the roof is lifted and filled with solar panels and solar thermal collectors. The increase in price of these private residences is compensated for by a lower energy bill and the lower expenses of a so-called ‘green home loan’. Critics have praised the projects and several municipalities have shown their interest. From the evaluation of the project, it seemed that the late assignation of a subsidy led to some insecurity and ideas with respect to ‘premanufacture’ were not pursued.